The MAX module is a one-knob volume maximizer that transparently increases the overall sound loudness of a track or bus by reducing the dynamic range. Use MAX as a convenient track leveler and compressor. Figure 443. MAX (volume maximizer) module. Clipping LED. 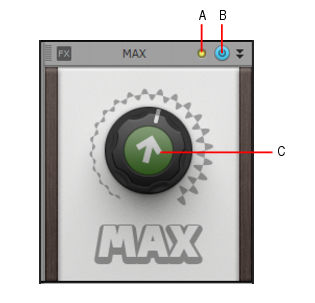 Shows if the input signal to the MAX module is clipping. If there is any distortion in the ProChannel signal chain, the clipping LEDs let you identify where the clipping occurs. MAX enable/disable . Enables/disables the MAX module. MAX. Adjusts the amount of dynamic reduction.